Maureen McHugh, a science fiction writer (who also enjoys "not science fiction" books), has written about the challenges of writing novels (and battling cancer) on her blog, No Feeling of Falling. She augmented her words - which unfold with exquisite openness and vulnerability - with a graphical depiction of the soul work involved in rising to meet these challenges, which is inevitably preceded by a descent of some kind. The image, appropriately entitled Dark Night of the Soul, is shown above; it first appeared in a post entitled Episode 1: Begin Anew, which offers a wonderful perspective from which to view new challenges. Yogi sent me a link to this image, after a recent guest presentation I gave at a UW Tacoma course on Social Networks, taught by Ankur Teredesai [the presentation was on how proactive displays bridge gaps between online social networks and shared physical spaces]. Yogi had encountered the image in yet another course, on Interaction Design, an area which also offers a set of challenges, though the image and the ideas it represents were more related to our broader conversation after the class about work, soul, passion and happiness. I wanted to continue that rumination here, because it brought to mind (and heart) a few strands of inspiration I've encountered elsewhere. [H]uman existence is half light and half dark, and our creative possibilities seem strangely linked to that part of us we keep in the dark. 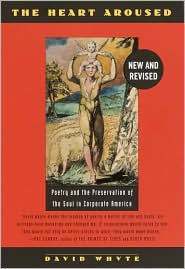 Whyte draws an analogy between Beowulf's battle with Grendel mother and each of our individual battles with the mother of all vulnerabilities: "the deep physical shame that we are not enough, will never be enough, and can never measure up". Or, perhaps, one might say, by facing, repeatedly, darker and darker nights of the soul. We all want to know where the point of transformation lies. I would say it is in “no space,” the place we come to after exhausting everything we know…and everything we are, a point of pure meditation. 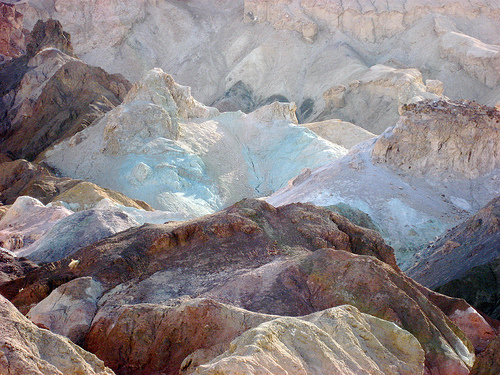 The current theory base, exemplified by Oscar Scharmer’s “Theory U”, suggests exactly this process of emptying ourselves of everything known so that we can listen to a best future Self, a source of deep intuitive wisdom... Scharmer describes the bottom of the U as where we touch a larger field that goes beyond our present awareness, a place of new insight and new consciousness that enables us to solve the problems we have been stuck by using our current, more limited awareness. 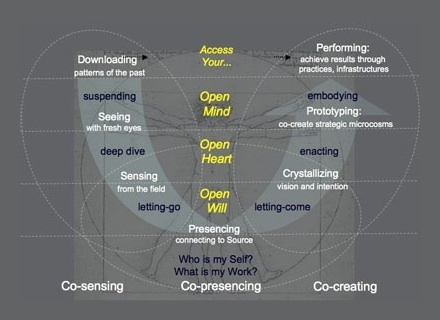 I still have not read Theory U (yet), but revisiting this image reveals another dimension of connection (for me (and my work)), with respect to the inspiring ideas of co-sensing, co-presencing and co-creating - not to mention open mind, open heart and open will - so I've ordered a copy of the book. Meanwhile, based on what Dan has written (and what I've experienced), I suspect the process of descending and rising from the depths of our selves and our work is an ongoing educational journey ... leading through a series of dark nights of the soul(s) ... and, hopefully, some bright days, as well. Oh, I almost forgot to add that the image also reminds me of stories I've heard about "thesis hill", a visual representation that Roger Schank (my academic "grandfather") employs - or employed - in his meetings with graduate students. Thesis hill, as I understand it, was depicted using an inverse geometric representation - climbing a hill vs. descending into darkness - but in my experience, and in the experience of many people I know (including many of Roger's former students - my "uncles" and "aunts"), working on a Ph.D. thesis often requires persevering through many dark nights of the soul ... and Rilke's quote about repeated, decisive defeats by greater (or, at least, more powerful) beings is one of the best, short verbal characterizations of graduate school - and especially, a thesis defense - that I've encountered ... rivaling the visual characterization of the Dark Night of the Soul. And, I suppose, writing a science fiction novel has many characteristics in common with writing a Ph.D. [scientific] thesis, just with varying intentions - and interpretations - with respect to the relative use of fact and fiction. I want to share a hypothesis with you - one of the biggest issues in developing integrated information is data “mining” and what is really needed, at the core of this issue, is data “ours”ing. You may be thinking of data mining as in, “the process of automatically searching large volumes of data for patterns”. I am not referring to this definition, but a new alternative definition for data mining meaning, “acting in a manner where this data is mine” As an example, John did not share company information as he was “data mining”, declaring that the customer contact information was “his” own personal information that he collected and thus declared “this data in mine – not the company’s or anyone else’s”. According to dictionary.com, the definition of integrate is “to bring together or incorporate (parts) into a whole” and the definition of disintegrate it is “to separate into parts or lose intactness or solidness; break up; deteriorate”. Government agencies not wanting to share critical information about counter-terrorism. This illustrates that lives are sometimes at stake if we don’t appropriately share. For example, in the September 11th incident, there were two hijackers that were on the FBI’s most wanted list and another two hijackers who had expired visas and the airlines did not have access to this information. There may have been regulations, privacy, and security considerations that hindered sharing. But could we have shared this data more effectively and were there motivations of not wanting to share? What can we do? Mahatma Gandhi said "Be the change you want to see in the world". If we each share more and consider data to be “ours” as opposed to “mine” more often, then I believe we will move towards data integration as opposed to data disintegration. - Identify one of your most valuable pieces of data. - How willing are you to share it and under what conditions will you share it? contributed many ideas to these template models for which I am so grateful. So at a deep level, are the ideas contributed by others owned by me? I must admit, that right now as I write, I feel a certain amount of discomfort (and data mining). Hey, I spent a great deal of my career on this repository of models! I own this. I have paid for this by paying others and with my time. So, data “mining” arises. I do have certain legal rights regarding this data and at one level there is ownership by my company, Universal Data Models, LLC. On another level, I cannot personally claim ownership to many of the ideas and if I spend too much energy towards these being “my” ideas and “my” data, then they would not be as shared and integrated into the industry where they can be of greater benefit. The benefits of information sharing and data “ours”ing can be realized and cultures can be changed to produce extremely positive outcomes. For example, a Fortune Magazine article [Seagate's Three-Day Revolution] told the story of how Seagate Technologies returned to financial health based on a change in culture from being “divided into vertical silos” to “putting group genius to work”, a buzz phrase from Matt Taylor, who developed a collaboration process called DesignShop that was used by Seagate and many other firms to help change culture via Capgemini’s Accelerated Solution Environment. As a consultant, I have been involved in a few remarkable examples of the power of sharing information and data “ours”ing. For example, in a large financial services organization, the healthy environment that was developed enabled an enterprise wide system where there was appropriate sharing of client information throughout the enterprise, as well as with the clients, resulting in much better service levels. Perhaps the next time someone is reluctant to share their data in a data warehouse, master data management or data management effort, we can better understand the behavior and influence more powerful and collaborative behavior. I invite us to share more and be an example of moving towards data integration versus data disintegration. I invite us to see data more as ours and less as “mine”. I invite us to move from people silos towards people integration and thus move towards data integration. I also invite us to share ideas about this topic with each other. I welcome any feedback from you and any thoughts regarding how we can move from data “mining” to data “ours”ing. Thank you. 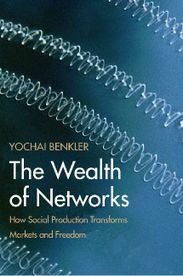 I have been very slowly reading and digesting The Wealth of Networks: How Social Production Transforms Markets and Freedom, by Yochai Benkler. It is truly a labor of love. The more I read, the more I am convinced that this is book is / will be a significant part of the canon for the paradigm shift represented by Web 2.0. But it is not, by any stretch, an easy read -- I'm averaging around 5 minutes per page ... reminding me of the richness and density of materials I studied when I was a philosophy major at Ripon College (where my page reading rate was often even slower, e.g., for Heidegger and Sartre). The Wealth of Networks describes how the increasing availability of tools for producing information, knowledge and culture is changing the nature of society. Participation in commons-based peer-production -- and sharing -- is an increasingly important component in the emerging networked information economy, to the point where it offers an alternative to the more traditional market-based proprietary production and transaction models that have characterized industrial society. As we enter the post-industrial era, the physical capital requirements that gave rise to hierarchical organizations of labor are diminished, enabling more people to participate in production -- individually, or through more loosely configured networks -- based on a greater variety of motivations (self-expression, religious or political fervor, hobby, community-seeking) than financial return on investment. Or at least, that's my current take on it, after reading about a third of the book so far. Among the Reds, the storyteller is a hereditary position, and he or she alone decides which stories to tell. Among the Blues, the storyteller is elected every night by simple majority vote. Every member of the community is eligible to offer him- or herself as that night's storyteller, and every member is eligible to vote. Among the Greens, people tell stories all day, and everywhere. People stop and listen if they wish, sometimes in small groups of two or three, sometimes in very large groups. Stories in each of these societies play a very important role in understanding and evaluating the world. They are the way people describe the world as they know it. They serve as testing grounds to imagine how the world might be, and as a way to work out what is good and desirable and what is bad and undesirable. Since the stories play a substantive role in individuals' perceptions of how they might live their lives, that practical difference [between evening-only vs. anytime storytelling] alters the capacity of individual Blues and Greens to perceive a wide and diverse set of options, as well as to exercise control over their perceptions and evaluations of options open for living their lives and to exercise the freedom themselves to be storytellers. Gertrude [a Green] has many more stories and storytelling settings to choose from, and many more instances where she can offer her own stories to others in her society. She, and everyone else in her society, can be exposed to a wider variety of conceptions of how life can and ought to be lived. This wider diversity of perceptions gives her greater choice and increases her ability to compose her own life story out of the more varied materials at her disposal. She can be more self-authored than either Ron [a Red] or Bob [a Blue]. That is, the Green society thrives [in part] through mutual inspiration! Yes! This is what really keeps me coming back to blogging. Although I write my blog primarily for my own benefit (and as I've noted earlier, in a post on unfolding through blogging, I'm increasingly aware that anything I say or write in any medium is primarily, if not solely, for my own benefit), I am always delighted, and often surprised, to discover that, occasionally, something I've written turns out to be of interest, use or perhaps even inspiration for someone else. And, of course, blogging offers a great channel for me to process the inspiration I glean from others' blogs, books and other media. Dan Oestreich's most recent post, about Leading is Not Acting: What Roles Do You Play?, incorporating comments to his blog as well as other bloggers' posts, is an excellent illustration of mutual inspiration in the blogosphere ... and offers some interesting insights into the stories we make up and tell about ourselves. Mutual information statistics underlie many of the relevancy algorithms used in information retrieval and machine learning. As more and more people utilize various dimensions of the architecture of participation represented by Web 2.0, and the notion of a person as a user (consumer) is transformed into the notion of person as a participant (producer and consumer), perhaps these traditional measures of mutual information can be refined to capture and process mutual inspiration, as reflected in the cross-linking conversations that emerge in the blogosphere. I wouldn't be surprised if some elements of inspiration are already included in the information used by search engines, but I suspect there is room for an alternative approach that places greater emphasis on the stories we tell to and about each other. Dan Oestreich's invocation of labyrinths and U's in a recent post on his Unfolding Leadership blog really got my juices flowing. I started posting a comment, but it got so long I decided to take it back here, include some of the most inspiring pieces (er, which is most of his post, actually), and riff on them a bit. What he presents is both a beautiful new model and an exquisitely old one. Those of you familiar with labyrinths know them as a profound spiritual tool of unknown antiquity, a tool that is still eminently vital and provocative as a way to access inner wisdom. It is at the center of the labyrinth, metaphorically the bottom of the U, where awareness is born, the seed of a new way of being. Once the seed is grasped, doors unlock, and a transformed way of living may arrive, gradually over time, or in an instant. 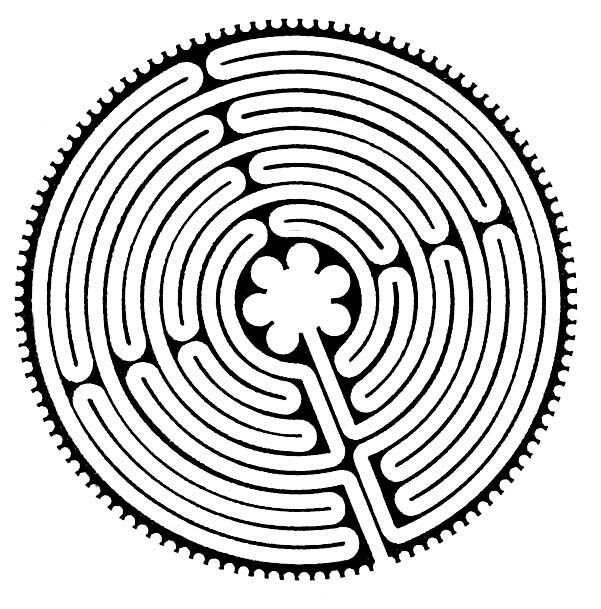 The “process” of walking a forty foot wide labyrinth is deceptively simple: 1) Wait for the readiness to enter; 2) walk forward, just following the path — this is not a maze — sequentially letting go of the past and surrendering to new knowledge; 3) humbly welcome insight at the center; and 4) return to the world, reflecting on the how your world is changing. 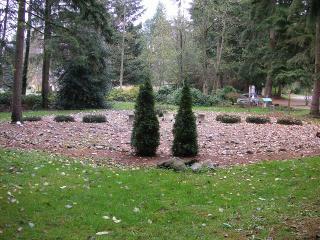 Near where I live is a labyrinth that I walk sometimes. 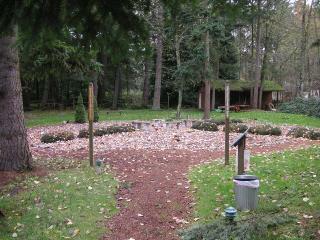 In the center is a mound of shells and a simple stone bench. Like past lives that have served well and are now gone, the shells at the center remind me how I am often faced with grief, and in turn, in touch with these feelings, I am also able to recognize my splintered but real wholeness. 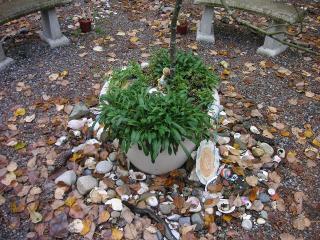 If I cannot experience the grief, I cannot remember the richness of my life and its fundamental wholeness. But when that sense does come, the answers often come with it. 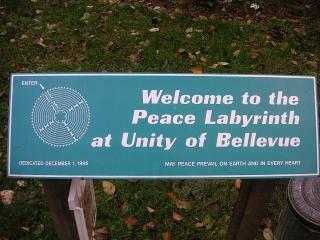 I, too, have walked the labyrinth at Unity of Bellevue that Dan mentions (shown above), and found it to be a profoundly serenity-inducing experience. Dan's juxtaposition of Theory U with labyrinths evoked a vision of a three dimensional labyrinth, where the center is at the bottom of the "U" (which, in three dimensions, would be more of a bowl or cup), and the gradual slope of the switchbacks along the edges helps facilitate navigation into the valley (or pit) and back up to the top of the hill (or peak). During a recent workshop through which I learned about the dance of leadership, the leaders invoked a number of concepts from The Archetype of Initiation: Sacred Space, Ritual Process and Personal Transformation, by Robert Moore. They used the image of a "U" in visualizing the stages of descent, transformation and subsequent ascent, which seems closely aligned with the notion of presencing that Otto Scharmer speaks of (he uses the terms co-sensing, co-presencing and co-creating for these three stages). The leaders of this and other Mankind Project workshops always emphasize the critical importance of building a safe container within which those who are willing to be led can open up to their shadows and gold, and use these to express more fully who they really are. Thus, the 3D "U" also can be seen as a sacred container. Don't sit down, it's time to dig another one. Looping back to the leadership theme, this landscape represents the ongoing challenges of leadership: leaders are those who have been willing to descend into their pits, transform themselves and ascend to new peaks ... and thereby become better able to guide others through similar terrain. 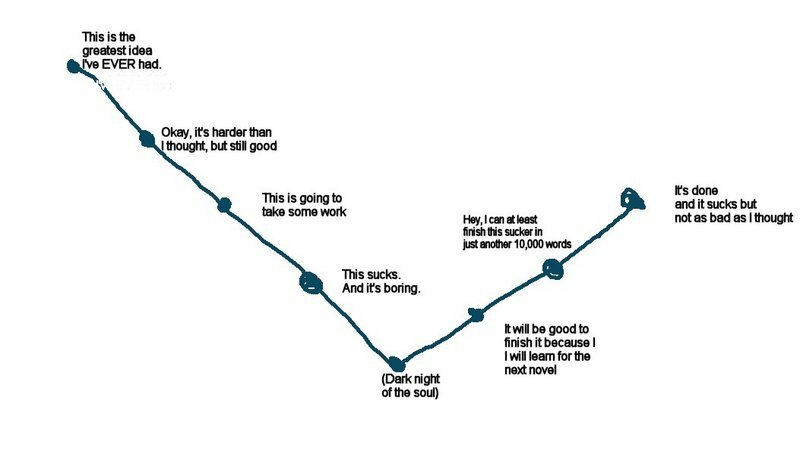 In my own experience, the further I descend into a pit, the harder it is to see the peak, and so it requires faith and will to continue descending rather than stopping or climbing back to what earlier seemed like "high ground". And, when I am willing to persevere through the ascent to the next peak, I gain a new perspective on the surrounding peaks and pits, and see that the journey can continue, if I'm up -- and down -- for it. The descent also reminds me of the dis-illusionment that Dan Millman talks about in Way of the Peaceful Warrior, which I started re-reading recently (I haven't seen the movie, though) . Although the term is often interpreted as having a negative connotation, Millman's mentor, Socrates, suggests that disillusionment is actually a positive development, as it is only through releasing our illusions that we can gain a clearer perspective on reality. This image of an open palm evokes the notion of "let go in order to receive". As long as I am tight-fistedly clinging to the old -- or perhaps, resting on my laurels at the top of the last peak I ascended -- I cannot fully open up to the new ... and I certainly can't wash my face very effectively with clenched fists :-). After packing up our proactive display equipment from the Zino Society event, we headed over to BalMar Lounge to observe another kind of technology used to enhance interactions among people attending an event: a Lock and Key Party organized by Space City Mixer. The Lock and Key Encounter is a very interactive social mixing game where each person tries to find their matching hardware amongst the group of participants. It works like this . . . Every female attendee receives a lock. Every male attendee receives a key. The object is to find the Lock that fits the Key and the Key that fits the Lock! For two hours, you try and meet each person at the event, getting to know them and of course, trying to match the lock and key. The object is to find as many -Matches- as possible. When you find a Match, you'll visit the Lock and Key Station, there you'll both enter your names into the Prize Drawing! Then you'll receive new Locks and Keys, and you'll go out again to try your new Hardware and find additional Matches. The more Matches that you find, the more times your name is entered into the Prize Drawing. You will not go away from this event only meeting a few people...here, you will have the opportunity to meet them all! Come out and try a Lock and Key Encounter - you'll end the night with scores of new friends and possibly more. Come with friends or alone as soon as it starts, you will quickly be meeting people as the participants approach you. See for yourself what the excitement is all about! We arrived late in the game, but Andrea convinced me to try a key on for size, and experience the magic for myself. And what an experience! I could see the genius in this "speed-dating on steroids" arrangement: every woman I approached held up her lock, regardless of whether she was unengaged, engaged in a conversation, or engaged in an exchange that might well have been leading to more than conversation. This "easy in / easy out" approach, where each participant can make momentary eye contact, say hello (we were wearing name tags) and exchange a few words -- if only about how many matches each has found -- provides a perfect example of the thin slicing that Malcolm Gladwell talks about in his book, Blink. Any woman who wanted an excuse to disengage from a current conversation partner could do so the next time a new key came around, and any man who wanted to disengage from a partner could do so on the pretext of wanting to find more matches (and claim prizes), reducing the risk that anyone will take anything personally. Scott observed from the sidelines that there appeared to be three types of participants: those who were relatively passive (responding only to others' advances), those who appeared to be selectively active (taking some time with each of several prospective matches) and those who appeared to be almost hyperactive (trying as many matches in as little time as possible). Obviously, there are different types of "prizes" one might take away from such an event, and so I imagine the strategies reflect different prize-orientations. Although I was only looking for the in-game experience (my wife has been encouraging me to investigate the singles scene as a target market for Interrelativity), I could see how this activity would provide huge opportunities for making different types of connections to a broad range of personality types. This experience also helped me appreciate the potential value of a slightly higher-technology approach to the same goal that I read about recently: the MatchlinC device used at OneKeyAway events. OneKeyAway events offer two extensions from the lower tech lock and key party described above. 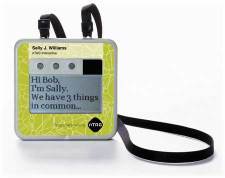 One is the substitution of the MatchLinC device, which is billed as a personal electronic relationship advisor, for the lower-tech locks and keys. 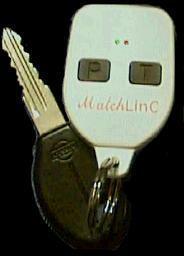 Each MatchLinC device is programmable, and so can actually be personalized in some way for each participant; short-range infrared signals are used to check for matches, so no physical contact is required (though, after having participated in an "old-fashioned" lock and key event, I'm not sure whether this lack of any physical contact is a bug or a feature). 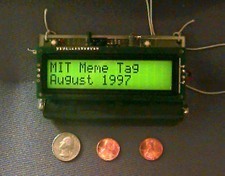 An algorithm is used to compare personal profiles stored on each of the paired devices, and a set of LEDs is used to indicate level of compatibility. I'd first read that MatchLinC uses a traffic light metaphor: green for compatibility, red for incompatibility, yellow for something in between (reminiscent of the Lovegety devices and other [fabled] derivatives), but the web site reports that 11 distinct levels of compatibility can be indicated on the device. The other difference is the use of a 64-item questionnaire that participants fill out before an event, whose results are used to program each person's MatchLinC device. This approach sounds very similar to the Meme Tags that Rick Borovoy and his colleagues developed at MIT Media Lab almost a decade ago, and which formed the basis for nTag, Rick's venture to commercialize this social technology, athough I think the original Meme Tag questionnaire included only seven questions and the newer nTag devices enable questionnaires to be filled out on the device itself. This seems like quite an extensive profiling mechanism, and while the MatchLinC devices purportedly encode the individual profile responses to prevent hacking into another device to learn specific responses (vs. an overall compatibility indication), there have been reported instances of nTag device hacks, and so I wonder how secure these devices are. I also find it astonishing that people would be willing to fill out such an elaborate profile, but perhaps that is not such a stretch for people in the singles market, give some of profiling required for online dating services. All of these approaches represent new dimensions of the object-centered sociality that Jyri Engestrom wrote about with respect to the socializing that takes place in purely online social networks. It's not sufficient simply to put people together in the same space -- online or offline -- and expect them to connect with one another; proximity is important, but just as important is giving people something to talk about. Indeed, providing such "tickets to talk" was one of the goals behind our original Ticket2Talk proactive display application, but perhaps the ambience and subtlety we were designing for in the context of an academic conference isn't as important in a context where the number one goal of people is to make connections. In the context of a singles bar, and especially during a singles event, I'm sure that lighting up one or more LEDs on a device can get some interesting conversations going about the devices themselves (I imagine there is a significant novelty effect), and perhaps even some of the deeper questions -- about relationships, sexuality and religion -- that were used to program the devices. When I first read about OneKeyAway, I was very skeptical about this technology and its impact, largely due to my own bias toward designing technology that fits as closely as possible into the existing practices of people in places of use. The interactions at events depicted in photos seemed so, well, contrived. However, having participated in a "traditional" lock and key party, I can see how inserting technology -- whether physical locks and keys or higher tech devices that provide expanded functionality -- that creates or facilitates new practices can be very effective at helping people connect. I increasingly see how a variety of roles in society might be viewed from a customer service (or customer care) perspective, and how all our interactions can be seen as manifestations of customer relationship management ... and how we all might be better off if more members of society adopted this view, especially those in authority roles, such as doctors, teachers, corporate executives and politicians. Whenever I start focusing on something new -- buying a car, siring a child, or learning a skill or job -- I become keenly aware of examples all around me: suddenly, I see my make and model of car wherever I turn, the world seems filled with pregnant women, or the new skill or job seems universally applicable or useful. I suspect this perspective shift is at work in the current context, as I seek to learn everything I can about sales, and so everyone seems like a potential customer ... and, actually, I don't think this is a bad thing. In yet another series of examples of "When the student is ready, the teacher appears", I've been encountering all kinds of teachers who help me better understand the value of customer orientation. Yesterday, I was listening to the audiobook version of "Blink: The Power of Thinking Without Thinking" by Malcolm Gladwell. In the first chapter, Gladwell describes research by John Gottman and his colleagues into specific affective factors that are highly correlated with successful and unsuccessful marriages (or, more precisely, marriages that last more than or less than 15 years ... I suppose "success" is a value judgment). The research revealed that contempt and condescension are highly correlated with divorce. Contempt and condescension is also predictive of another type of legal action: malpractice suits. A doctor's relationships with his / her patients is a much more significant factor in predicting whether the doctor will be sued for malpractice than any other factor (even, surprisingly, the number of medical errors the doctor commits). Doctors who spend more time with patients, who treat them with respect rather than condescension -- and yet make mistakes -- don't tend to get sued. I'm not sure how much this trend benefits the patients, or society -- and I don't want to delve into the malpractice reform controversy (here) -- but I'd argue that this customer service orientation at least benefits the doctors. Kathy goes on to teach by example, sharing her considerable insights and experiences into teaching: the importance of getting and keeping attention and interest, viewing learning as a process of co-creatiion, and relentlessly focusing on -- and making the benefits clear to -- the customer (er, I mean, student). The notions of empathy, respect and offering meaningful benefits recur throughout many of her blog posts (e.g., on teaching and advertising), and I expect she would concur that a stronger customer care orientation on the part of teachers would be A Good Thing. As I mentioned previously, Dan Fine espouses a rather comprehensive view of one's customers, including in that set a broad range of people with whom we regularly interact in a business context: vendors, employees, partners, media, investors or people who purchase your product or service. The unifying theme is that you need to "sell" a compelling value proposition to all of these stakeholders. I was reflecting on this view during my recent equity negotiations with a potential partner ... and how important it is not only to treat all prospective customers with respect, but also to cultivate a relationship of mutual respect (as would also be the case with doctors and teachers). Politicians are another group that sometimes appears to lack a customer care orientation. As with doctors who are sued for malpractice, I wonder whether politicians such as Tom Delay would be in their current legal predicaments if they were more inclined toward empathy, respect and helpfulness. Perhaps part of the problem is who they view as their customers ... and perhaps I have too narrow a view of who a politician's customers are ... or ought to be. I admit to not being entirely clear about who my customers are. The proactive display applications developed by Interrelativity are designed to facilitate networking ("interrelating") among people attending an event by showing content from attendees' online profiles on a large computer display when those people are nearby (creating "tickets to talk"). I don't expect that attendees themselves will pay extra -- directly -- for the enhanced networking opportunities, but rather that event hosts and/or sponsors would pay for our services, and I'm exploring other potential groups that might value some exposure on a proactive display. Thus, there are different value propositions for different stakeholders, each with different costs and benefits, which adds complexity as well as potentially conflicting goals. Having different groups of stakeholders may also be part of the customer orientation problems in the other examples listed above. Doctors (in this country) tend to be paid primarily by insurance companies, rather than their patients ... and I don't get the sense that there is a strong tradition of empathy, respect and helpfulness in the relationships between medical professionals and insurance professionals. Perhaps this lack of full, direct payment interferes with the perception of the patient as a customer on the part of some doctors. Teachers often do not get paid directly by the customers they have the most interaction with (students), and in the case of K-12 public school teachers, they don't even get paid directly by another group of customers (the students' parents and guardians), and so the intermediating layers may similarly complicate the adoption of a customer care orientation -- by some teachers -- toward their students. And, while we, the people, typically pay the salaries as well as vote for our elected officials, there is not a direct payment connection between most constituents and politicians. Politicians have a broad array of people and groups who may offer them financial and other types of compensation -- with varying degrees of directness -- for their attention to specific interests ... and so it's hardly surprising that some politicians may have different ideas about their customer base: who they are really serving (and why). In general, I think it's difficult to clearly distinguish customers and potential customers from people will never be -- or know -- any customers or potential customers ... which is a powerful motivation to always be a mensch. Alex Pang has written an insightful and provocative article entitled "From iPod to ourpod: Will it become a more social machine" in the Mercury News, in which he talks about the evolution of personal music technologies (including transistor radios, Sony Walkmans, and portable CD players) that have enabled us to carry our music with us. Younger people have naturally gravitated toward such devices, as they allow users to escape from being subjected to the musical dictates of their parents (and other authorities). The Applie iPod represents the most advanced instrument for the construction and maintenance of this personal musical space. Alex points to a number of interesting social dimensions of widespread iPod use, such as podjacking (momentarily plugging one's earbuds into another's iPod) and the sharing of playlists on a computer network, and references a futuristic scenario sketched out by Clay Shirky involving group playlists dynamically constructed at a bar. [I recently blogged about a number of other prototypes that illustrate community-oriented possibilities for technology and music.] However, I do not believe that iPods themselves will lead to stronger community bonds, and, in fact, believe that such personal devices will lead to more technology-enhanced isolation, as iPod users can more effectively ignore the people -- and sounds -- around them while on an "iPod holiday" ... similar to the antisocial effects of WiFi laptop users who can ignore the people in their physical community (even when physically present in "third places" with high levels of community and social interaction) while tunneling out to their virtual communities, many of whom wear earbuds, presumably to reinforce the walls of the virtual tunnel. "Swallowing half an hour before closing time, that second dose of soma had raised a quite impenetrable wall between the actual universe and their minds." "I don't understand anything," she said with decision, determined to preserve her incomprehension intact. "Nothing. Least of all," she continued in another tone "why you don't take soma when you have these dreadful ideas of yours. You'd forget all about them. And instead of feeling miserable, you'd be jolly." I agree with Alex' claims that people often have very strong intimate connections to individual pieces of music, and that listening to those pieces of music can evoke powerful emotions. I also believe that emotionally charged revelations -- including revealing one's most intimate musical experiences -- can foster stronger connections with others (and in fact, I recently experienced this through the emails I received after I wrote about a very strong emotional reaction to CSN's Long Time Gone). However, I believe that the iPod devices themselves are just another brick in the wall of social isolation.